OFF PISTE! The new MEGA-Solo for T&T by Alligator publishing. One of the largest solitaire adventures available, this is an adventure with a difference . . .
". . . . as your feet begin to freeze and your teeth chatter, you wonder if this is going to be much of a holiday . . . . . each ticket may be used on any of the ski lifts . . . . . today is special . . . . today is Competition Day!" The culmination of 4 years research, writing, sketching, editing and playtesting. Off-Piste! has huge replay value, and will keep you entertained with a combination of drama, danger, and humour. Off-Piste! is a solitaire adventure for Tunnels & Trolls version 5 or 7, and is written for beginning characters with fewer than 15 adds. 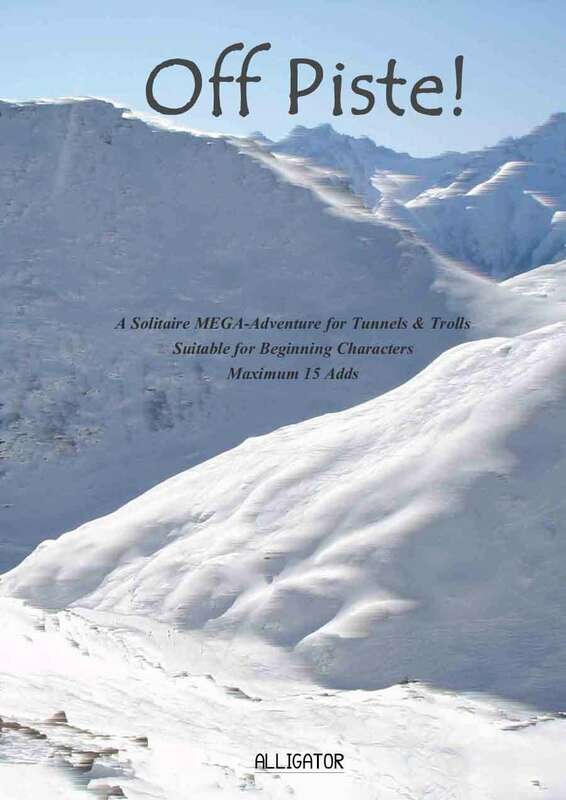 Particularly designed for those who mainly play solo adventures; if you struggle to find fresh adventures for your beginning characters, then Off-Piste is for you. With its high replay value, varied gameplay, and optimum mix of challenge and reward, you will find it the ideal training ground for all your first level characters. Happy skiing!